The June Lake Loop promises year-round adventures - warm sunny summer days trout fishing in the streams, hiking through high alpine meadows scattered with vibrant spring wildflowers, marveling at the glowing golden fall colors and dipping into natural hot springs after a day of adventure in the snowy High Sierra. A year-round destination with plenty of fun, activities, festivals and events for those looking for adventure or to simply relax and unwind. Hiking - The hiking around June Lake and the nearby Yosemite National Park and Ansel Adams Wilderness seems endless. Explore the stunning mountain landscapes of the High Sierra on some of the best hiking trails in the US, complete with spectacular vistas, stunning falls colors, and beautiful glacial lakes. Rock Climbing - Stay local by bouldering just outside of June Lake, sport climbing in Clarks Canyon and the Owens River Gorge, or head up Tioga Pass to Tuolumne Meadows on the east side of Yosemite National Park for world-class rock climbing. Fall Colors – The vibrant, colorful aspens that blanket the Eastern Sierra make June Lake a sought after fall vacation destination. Drive along the June Lake Loop on Highway 158, which is lined with golden aspens during the autumn season or hike into the local wilderness areas for spectacular displays of golden, yellow and red aspen leaves rustling in the wind. Soak in nature’s natural spas – Enjoy solitude and spectacular scenery as you relax and unwind in one of the many bubbling natural hot springs near June Lake. Many of them are off the beaten path but a little direction will lead you to the best hot springs in the area. Fishing – Besides the exceptional fishing on the Loop’s four lakes, there are many mountain streams to quietly cast a line and hook a trout during the warmer months. 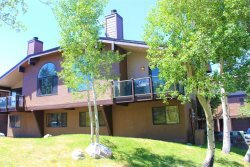 There are many guides in June Lake that will ensure you the ultimate fishing experience. Water-sports – Enjoy a day in paradise on the beautiful glacial lakes surrounding June Lake. Water-ski and wake-board at Grant Lake, kayak the deep blue water of Silver Lake, paddle or sail the waters of Gull Lake, or swim from the sandy shores of June Lake. The June Lake Loop is the perfect destination for water lovers. Day Trips – There are many inspiring and beautiful places to explore just a short drive from June Lake. Yosemite National Park, a piece of paradise with plunging waterfalls, giant sequoia groves, and scenic peaks, is only a 30-minute drive north of June Lake. 20 minutes to the south is the premier mountain resort town of Mammoth Lakes and the gateway to the Reds Meadow Valley, Devils Postpile National Monument, and the Ansel Adams Wilderness. Hike to Thousand Island Lake, a remote wilderness area of spectacular beauty and one of June Lake’s best kept secrets. Other nearby sites in the area to visit are The Mono Lake Tufa Reserve, drive along the historic Tioga Pass into Tuolomne Meadows and the rest of Yosemite National Park. For something completely different, head to Bodie, California’s official state gold rush ghost town where more than 100 buildings remain standing - Bodie is the most well-preserved ghost town in the US. Winter Adventures – June Mountain Ski Area consists of two mountains, Rainbow Mountain and June Mountain connected by Rainbow Ridge, and offers 1,500 acres of magical winter snow and powder amidst High Sierra scenery. The diverse terrain is 80% beginner and intermediate with six chair lifts, 35 runs, terrain parks to entertain, short lift lines, and inexpensive lift tickets. A quieter, family-friendly alternative to nearby Mammoth Mountain. Skiers looking for more solitude and open spaces can even ride J7 to the peak of June Mountain for access to great backcountry skiing! Other wintertime activities in the June Lake area include exploring the terrain on the loop during a fun day of snowmobiling, escaping to the beauty of the mountains for scenic cross-country skiing and snowshoeing, or heading to the Silver Meadow trails closer to town. For the ultimate winter adventure, June Lake also offers exceptional ice climbing both for beginners and those looking for the ultimate thrill. Beginners can scale the frozen Horsetail Falls or for a bigger challenge head to Lee Vining Canyon. Guides are available in the area.